From a XV century venetian painter Carlo Crivelli's painting (Venetian painter, now in the Pinacoteca Civica of Macerata . 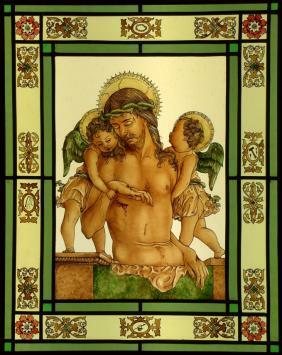 This stained glass panel has a central tile in mouth-blown glass (and others glasses), framed by a decoration made of cathedral glass, and lead. 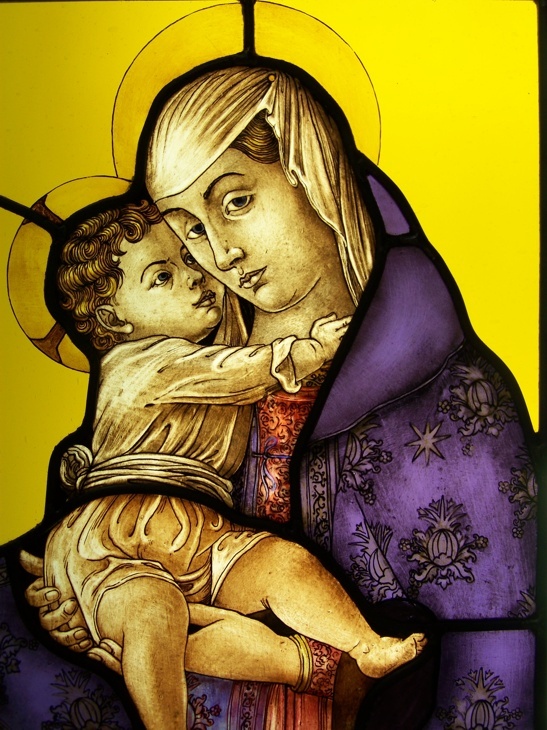 Fired grisaille and multicolored enamels painting. Dimensions 40 by 50 centimeters. From a XV century venetian painter Carlo Crivelli's painting (Venetian painter, now in the Pinacoteca Civica of Macerata . 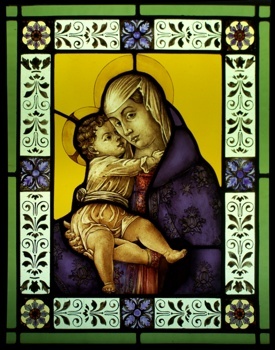 This stained glass panel has a central tile in mouth-blown glass, framed by a decoration made of cathedral glass, and lead. Fired grisaille and multicolored enamels painting. Dimensions 40 by 50 centimeters. From Carlo Crivelli's Montefiore polyptych, (Venetian painter, 15th Century) now in the National Gallery in London. 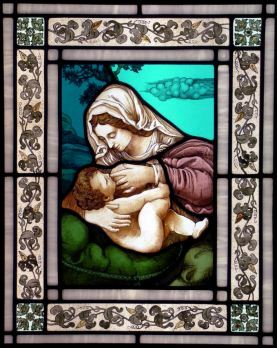 This stained glass panel has a central tile in mouth-blown glass, framed by a decoration made of cathedral glass, and lead. Fired grisaille and multicolored enamels painting. Dimensions 40 by 50 centimeters. 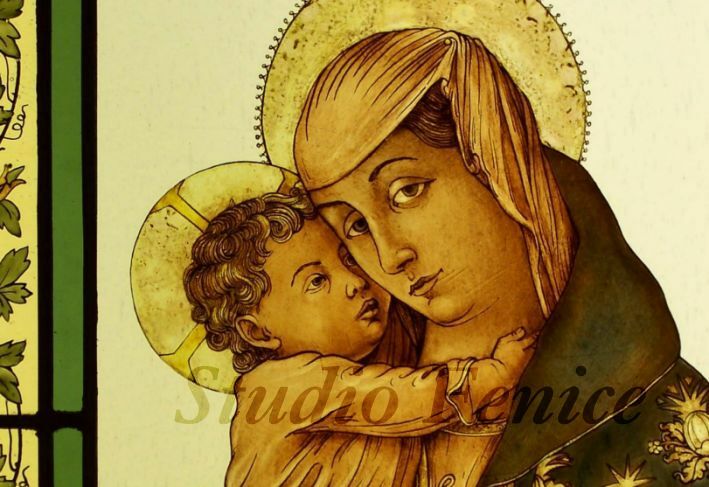 From a Carlo Crivelli's painting from a painting by Carlo Crivelli (Venetian painter, 15th Century). 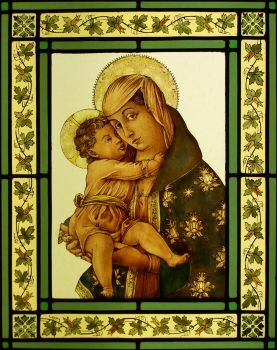 Stained glass panel with central tile in blown glass, framed by a decoration made of cathedral glass, and lead. Fired grisaille and multicolored enamels painting. Dimensions 40 by 50 centimeters. 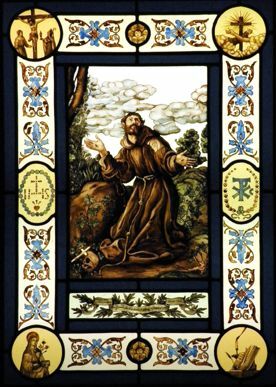 1.5) S. Francis from Assisi receiving the stigmata. 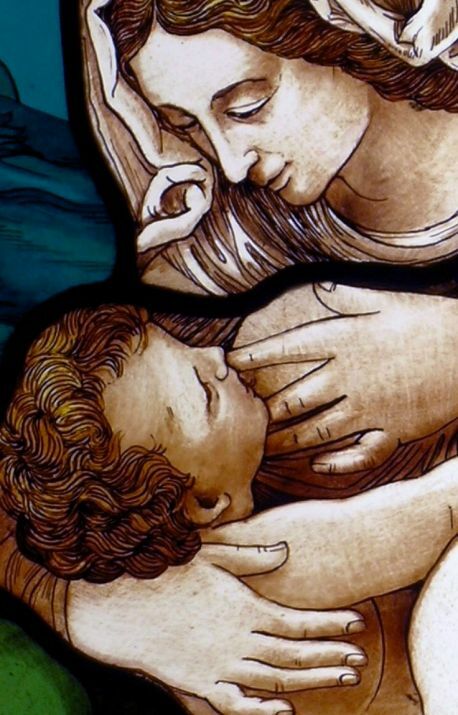 From a XVII Century Gennari's painting, now in Cento, Ferrara. 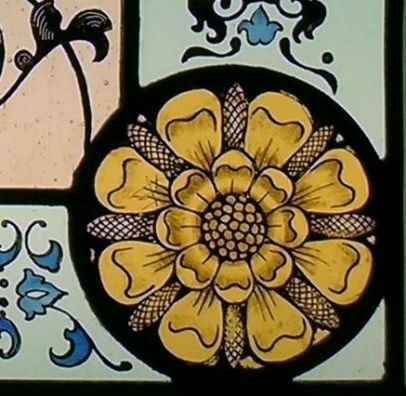 'The stained glass panel has a central tile from a painting by Gennari, 17ththCentury, Cento (Ferrara). 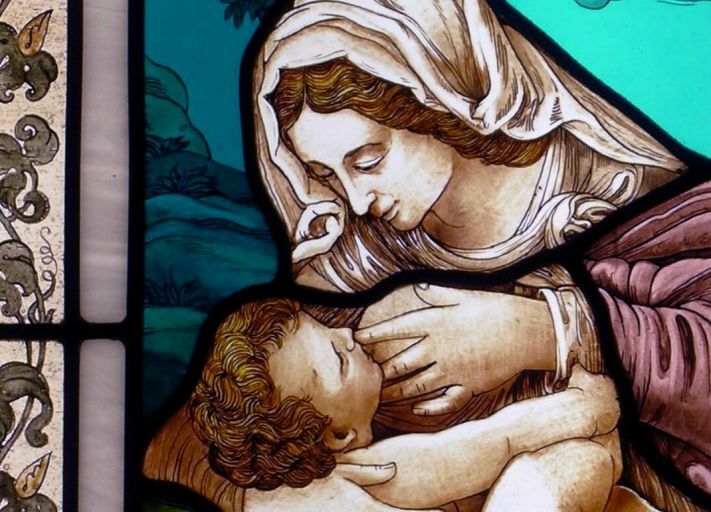 This stained glass panel has a central tile in mouth-blown glass, framed by a decoration made of cathedral glass, and lead. Fired grisaille and multicolored enamels painting. Dimensions 50 by 70 centimeters. From a 1507 painting by Giovanni Battista Salvi, also called Sassoferrato, Painting is now in the Louvre Museum in Paris. 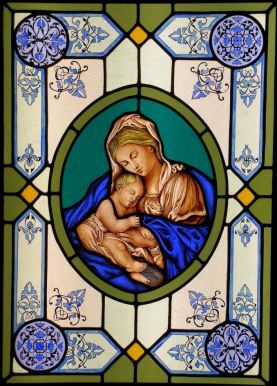 This stained glass panel has a central tile in mouth-blown glass, framed by a decoration made of cathedral glass, and lead. Fired grisaille and multicolored enamels painting. Dimensions 50 by 70 centimeters. 1.7) Madonna with the green pillow. 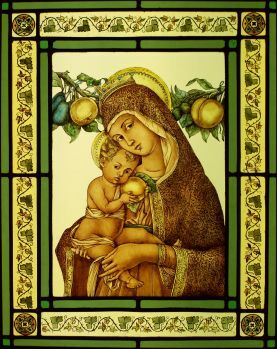 From a painting by Andrea Solario (XV-XVI Centuries). 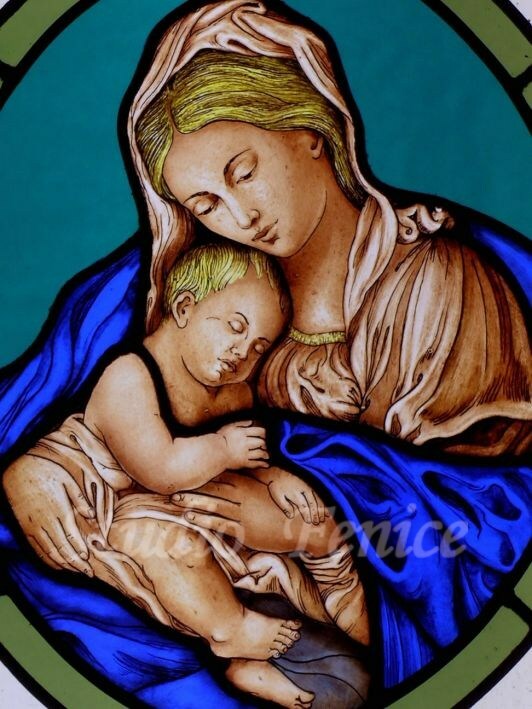 This stained glass panel is made with mouth-blown, cathedral and white opalin glass in the frame., and lead. Fired grisaille and multicolored enamels painting. Dimensions 40 by 50 centimeters. © Studio Fenice S.n.c. Tutti i diritti riservati.